Yesterday we celebrated our 100th day of school for the year. We have had our sights set on this day since day one of school. For the first 20 days of school we kept track of the days using math manipulatives such as pop sticks, ten frames and unifix cubes. This was a fun and authentic way to introduce these new tools. As the days went on and our number of days at school increased we moved onto tracking our days on a calendar counting each day taking note of weekends and school holidays. As we came to the end of term one and noted we had been at school for 50 days we predicted when we would hit 100 days at school someone guesstimated about the end of term to as 50 + 50 is 100!. Towards the end of term two we noticed our number was getting higher but we weren’t going to get our 100 days before the end of term. We counted on and put a mark on our calendar, Tuesday, week 2, Term 3!!! During our first week back this term we completed a brain storm highlighting all the things we could do to celebrate. We selected a few from our large collection of ideas and waited excitedly for the day to arrive. Our entire day revolved around the number 100! On the morning of our 100th day we each brought in a small ziplock bag with 100 items inside. We compared these items noting how 100 can look so different. Over the coming week we will use these items to compare mass and collections. What a buzz there was about the rooms as the children excitedly explored what their classmates brought in! For morning fitness we completed 10 lots of 10 activities to equal 100!. 10 star jumps, 10 Laps around a cone, 10 left hops, 10 right hops, 10 high fives, 10 steps, 10 jumps, 10 slips, 10 push-ups and 10 toe touches!! During our morning skill session we participated in 6 different activities. 1. Build a 100 cup tower. This was an activity thoroughly enjoyed by all and an activity revisited by choice later in the day. It was fascinating to see the children work together to create a variety of 100 cup tower designs. 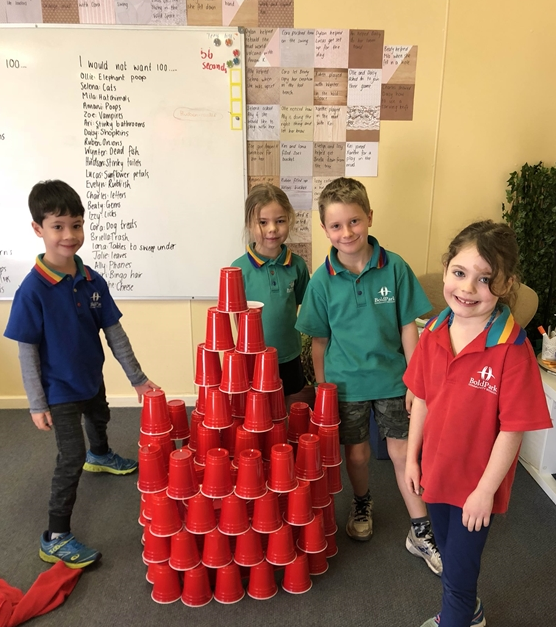 Initially the children began by building individual towers though they quickly realised in order to build a ‘100 cup tower’ they would have to work together and build one large tower. 2. Paint a 100 year old self portrait! We found the ability to computer generate pictures of the children at 100 years old and they did not like them at all declaring “I’m not going to look like that!! !” They then painted some very amazing elderly citizens. 3. Write 100 bucket filling notes! Yes 100!! 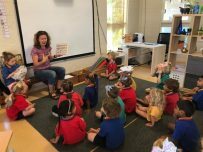 The children thought of kind bucket filling statements like “You are smart” “I love you” “You are kind” “You’re a great friend” “Have a nice day” and wrote them on small index cards. 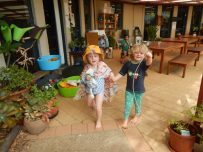 We sealed them in small ziplocks in case it rained and placed them around the playground during Bluearth for other children to find in the hope of brightening someone’s day. 4. Construct a 100 day hat. We know that 100 breaks down to 10 lots of 10s, which helps us with a lot of other maths concepts. So the children collected 10 strips and wrote 10 symbols on each counting in 10’s. 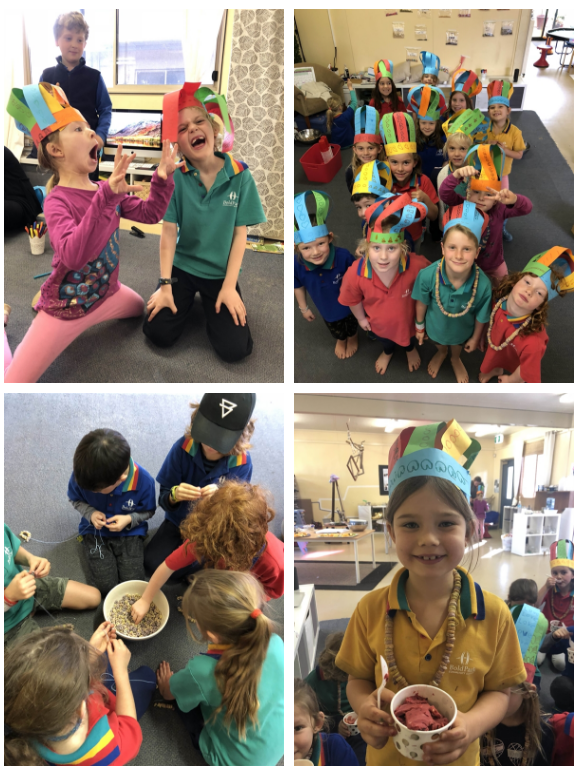 They created a large crown with the strips of paper proudly wearing their 100s hat for the rest of the day. 5. Create a 100 marshmallow structure . The trickiest part of this challenge was not eating the marshmallows!! 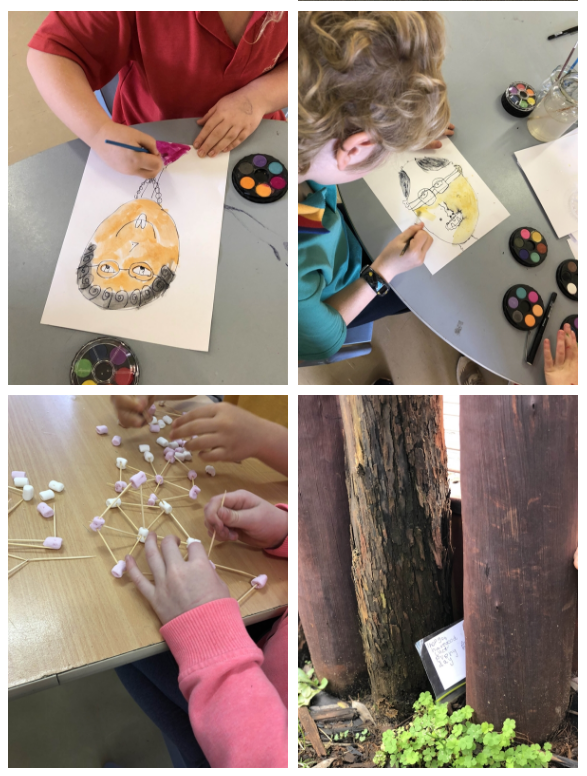 The children had to use toothpicks and small skewers to create a 3D structure of some variety this was a challenge that brought great success. 6. Write about you and the world in 100 years. This was a vary interesting activity and topic to explore in 100 years there will be kind Kwilenas in nursing homes with wrinkles and a lot of flying cars in the world!